Two strong homegrown companies forged ties recently to undertake real estate developments in Cebu. 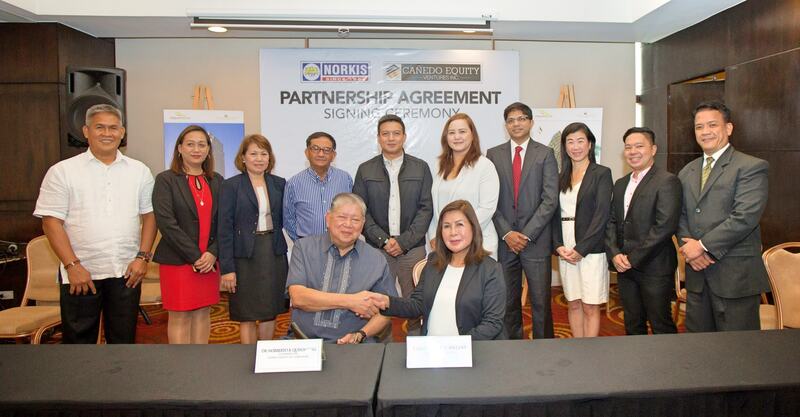 The Cañedo Equity Ventures, Inc. (CEV) and the Norkis Group of Companies officially sealed their partnership only last August, and two big projects are already in the works. These include a 10-hectare residential community targeted at the middle market bracket and a six-hectare memorial park in the northern town of Compostela, company executives said in a recent press conference. CEV chair Filomena Cañedo and Norkis chair Dr. Norberto Quisumbing, the two pillars of the conglomerates, affixed their signatures to the partnership during a separate and much earlier signing ceremony held at the Cebu City Sports Club. The collaboration is in line with CEV´s mission to address the housing backlog, catering in particular to the rising middle class made up of overseas Filipino workers (OFWs) and BPO employees and their families. “Compostela used to be a small and quiet town. Then the Cañedos came with all their ideas and development projects,” Quisumbing was quoted as saying in a press statement released by CEV. He also reportedly expressed high confidence in the venture. PARTNERSHIP. Cañedo Equity Ventures, Inc. chair Filomena Cañedo and Norkis Group of Companies chair Dr. Norberto Quisumbing seal the partnership between the two companies in the presence of company officials. Land development for the residential community in Compostela will take around two years, said Rey Maribao, CEV VP Strategic Corporate Planning and Business Development, during a talk with journalists. The project is first in line for the Philippine Paramount Property Ventures, Inc. (PPPVI) and Norkis partnership. It is scheduled to be launched by the last quarter of 2017. Norkis, a motorcycle manufacturer and distributor with land properties throughout the country, will benefit from horizontal, vertical, and mixed use development projects through CEV´s real estate arm PPPVI. Compostela is the best place for PPPVI to expand, according to Maribao, citing indicators showing that the third-class municipality is working to become a high growth area in Metro Cebu and a booming population growing at a yearly average of 2.27 percent. Norkis will likewise partner with CEV’s memorial parks development company, Celestial Meadows and Developers Corporation. Quisumbing said people will very soon see a progressive Compostela. Cañedo, for her part, thanked Norkis for partnering with CEV. “We are very honored to partner with the reliable Norkis Group. We are one with you in transforming Compostela into a better community. We look forward to working with you in developing Compostela and other parts of Cebu,” she said in the same press statement. CEV is a conglomerate in Minglanilla that oversees eight companies performing highly in the fields of real estate, parks and memorial, construction, food, training, and education.